People now expect their workplace in-house catering facility to provide food that can compete with what the High Street has to offer. Our product range can do this. We supply an extensive range of competitively priced, branded and well presented products to satisfy your workplace consumers and keep them off the streets! 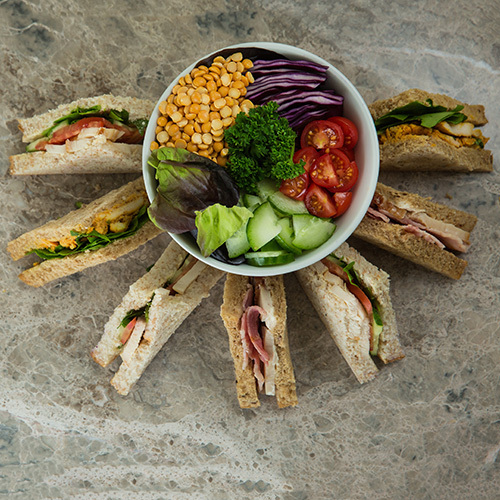 As well as an ever changing range of sandwiches, wraps, baguettes and paninis, we have a selection of all day products, ready to heat foods, sushi, salads and healthy snack pots. We offer seasonal ranges and regularly update our menus to reflect food trends. Our sandwich delivery service is 7 days a week. With great looking point of sale materials, you will compete with the best of what the High Street has to offer. Contact our team today to discuss which of our products would best suit the needs of your clients.